Our favourite dresses from the Golden Globes 2018! Golden Globes 2018! We saw some spectacular evening dresses! This year we saw celebrities wearing the colour black to show solidarity with the victims of sexual harassment and assault at the 75th annual Golden Globes in Los Angeles Sunday night. This blog will feature some of our favourite celebrity dresses from the Golden Globes along with similar dresses to hire from Girl Meets Dress. Angelina Jolie looked amazing in Versace. She wore a stunning black gown that featured a ruched bodice and sheer sleeves with feathered cuffs. We were loving the big sleeves so here is our choice of a similar dress to hire from us at Girl Meets Dress. The GANNI, Seneca Silk Dress is a perfect dress to hire for any event! Whether that may be a dress for a black tie event or a classic cocktail party! 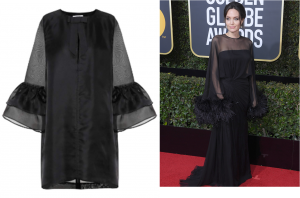 The Seneca Silk Dress is the perfect little black dress, and we are loving the big sleeves which is what stood out to us from Angelina Jolies dress! So why not hire a dress from us and receive your perfect little black dress. Kendall Jenner definitely made all faces drop when she made her grand entrance wearing Giambattista Valli. Straight from the runway of the designer’s fall couture collection. This statement-making as dress, with a mini hem at the front, and floor-grazing train at the back, Kendall makes sure to adhere to the black dress protest theme at the Golden Globes this year. Our choice below for the perfect dress to hire similar to Kendall Jenner’s! This ARIELLA dress is definitley a dress to hire for this season! A sensational black silk gown organza full length gown with a pleated ruffle bodice and tiered skirt. This dress is finished off with a fine net skirt at the hem, promising a beautiful silhouette. Detachable straps included. 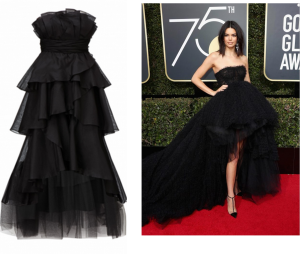 The perfect black tie dress, so why not hire a dress from us and get the Kendall Jenner ‘WOW’ look! Nicole Kidman in Givenchy! Big Little Lies star Nicole Kidman took home an award for the best actress in this series, and she looked amazing while doing so! Nicole Kidman looked absolutely stunning in a jaw-dropping black dress by Givenchy, which was the perfect choice for the event! This UNIQUE gown is gorgeous and elegant and the perfect dress to hire for your black tie event! This, Oriana gown is cut from swathes of fluid crepe. It comprises a pleated embellished black bodice and an black skirt that falls beautifully to the floor. We love how the black trim accentuates your waist at its narrowest point. So why not visit our website and hire a dress like Nicole Kidman was seen wearing to the Golden Globes 2018! Dakota Johnson looked timeless in this Gucci gown, that she walked the red carpet in. The glittery black Gucci gown which she paired with sparkling jewellery. It wasn’t until she turned around, however, that we fully appreciated the look. The back featured a crystal-embellished bow design, and completely left us stunned. It was gorgeous! Below is our choice for you to get the look and hire a dress just like this one! This JILL JILL STUART dress is, the classic sleek slip dress by inserting delicate Chantilly lace with a softly draped neckline. The fitted waist and flattering neckline epitomizes sophistication. Hire a dress from us and look as gorgeous as Dakota Johnson did! Posted January 8th, 2018 in GMD Daily. Tagged: 27 Dresses, ARIELLA, as seen on celebrities, ball dresses uk, ball gowns to hire, Black Tie, black tie dresses uk, black-tie dresses, Brits celebrity dresses, celebrity boutique dresses, celebrity designer dresses, celebrity dress, celebrity dresses for sale, celebrity dresses uk, cocktail dresses for women, dress to hire, Dresses for Ascot, dresses for events, dresses for hire london, dresses for weddings, ganni, Golden Globes, hire a black tie dress, Hire Ariella Couture Dress, Hire dresses, Hire dresses london, hire dresses uk, Hire Ganni dress, hire ganni dresses. All Birthday Girls Enjoy 20% Off! Best Dressed at the BRITS! Best Dressed at the Oscars! Best Dresses at the Fashion Awards 2017! Best Dresses from the Murder of the Orient Express! Can I Wear Pastels in the Winter to a Black Tie? Do Libelula Dresses Get the Bridal Seal of Approval? Dress Code Guide to social glamourings! Dress Hire London - Autumn Edition! Free Gift From White Glo On Your Next Order With Girl Meets Dress! Girl Meets Dress & the Fragrance Shop-Great Offer! Handbag.com Online Fashion Awards-GMD Voted 1st For Best Use of Innovation! Hire Black Dresses in the UK! Hire Evening Gowns in the UK! Hire Self Portrait Dresses in the UK! How to Wear a Dress in the Winter? I Want What She's Got! Jewellery to Buy- New on Girl Meets Dress! Kate Middleton in a Designer Dress? 'Fraid not! New Year, New Dresses to Hire! Online Designer Dress Hire: New Additions! Pretty, Lace And Beads With A Twist. Go On, We Dare Ya! Prom Dress Hire in London! Prom Dress Hire in Manchester! Summer Dresses to Hire in London! The Ultimate Gold Dress this Party Season! Valentine's Day Dresses for Chic by Choice Customers! What Dress Colours are in this January? What Dresses to wear in May? What to wear as a Wedding Guest? What to Wear for Chinese New Year? What to wear for New Year's Eve? What To Wear For Valentines Day? What to wear on Christmas Day? What to wear to a bottomless brunch in London? What to Wear to a Business Lunch? What to wear to a Formal Dinner? What to wear to a Spring Wedding? What to Wear to a White Tie? What to wear to brunch? What to wear to on Ladies Day at the Races? What to Wear to the Office? What to Wear to the Races? What to wear to your Office Christmas Party? What was the Duchess of Cambridge wearing at Paddington Station?